I travel a lot for work. I have a smartphone. It has a camera. I’m often pretty bored. The end result of all that is that I take and upload a lot of photos from my travels to the Google Maps photo repository. Google then uses them in location listings. No one has to upload their vacation snaps and other photos to Google Maps. But once you choose to, Google tends to assume you want to keep on doing so and will send your phone suggestions to upload your most recent shots. As I said, I’m often pretty bored, so I’ve uploaded a lot of photos. 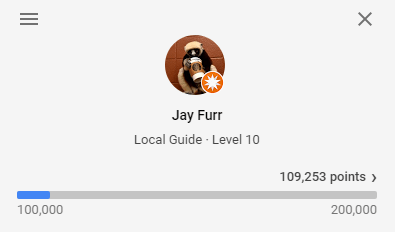 I’m a Google Maps “Local Guide” Level 10 user, as a result. And because I’ve uploaded so many photos and because I’m a Level 10 user, my photos often wind up being the cover photo of many locations on Google Maps (if the business or location owner hasn’t uploaded their own, that is). And that means that occasionally a shot I took in a moment of frivolity winds up being the public face of a theoretically reputable business or tourist attraction or whatever. The most egregious example of this is the entry for the Friendly’s restaurant in Williston, VT. Take a look. That photo at the top of some ranch dressing with rainbow sprinkles on top? That’s one of mine. I don’t know why, out of the dozens of photos I’ve taken at that Friendly’s that one wound up being the profile photo. But it did. And it’s been viewed (as of just now) 210,434 times. It’s a strange world we live in, my friends.